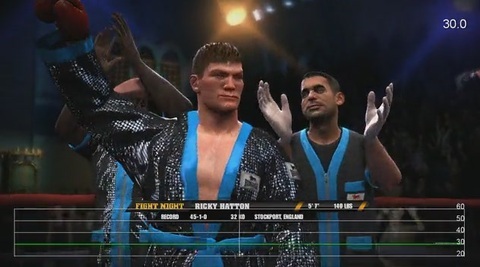 Good news for digital pugilists: EA Sports' forthcoming Fight Night Round 4 runs at an absolutely rock solid 60FPS, and more than that, demonstrates a superb level of visual quality. We've taken a look at the playable demo that's set for release later this week on Xbox Live (UK pre-orderers with a specific high street retailer already have the code) and are very impressed with the result. The game is confirmed to be running at native 720p, and utilises 4x multi-sampling anti-aliasing (MSAA), giving the highest quality edge smoothing without any impact on texture quality. Lighting and shadowing is a step beyond what we usually see, with spherical harmonics probably being used on the main characters for the best possible look. Traditional shadowmaps are all but completely absent (apart from the ground shadows) in favour of this higher quality technique. Onto the frame rate analysis then and the result is somewhat reassuring, although it's the probably the most boring graph we've ever produced. Gameplay is locked at 60FPS with not a single dropped frame, while cut-scenes - with more characters and dynamic lighting - is similarly locked at 30FPS. Any deviation you might see is simply from the running average on the graph as the clip transitions from 30FPS cinematic to 60FPS in-game action. Otherwise, there's not much more to add other than that the game looks and plays very well. We reckon there's four different LOD levels on the various characters in the scene, but all of them - including the crowd members - are all full 3D; there are no flat, poorly animated characters anywhere. We were concerned that a full 3D crowd might have an overdraw impact on the frame rate, but as the graph shows, it's an entirely consistent 60FPS. As for the gameplay, Fight Night purists will love the fact that punching via the face-buttons is no longer allowed, the flipside being that the all-important quarter-circle stick movements aren't quite as responsive as we would have liked. Other than that, it's all looking like good stuff. Quite how the PS3 version will look remains to be seen. EA's previous brawler, Facebreaker, dropped 4x MSAA in favour of 2x quincunx AA. Approximate levels of edge smoothing at the expense of texture detail - no big deal with the cartoon-esque Facebreaker, but perhaps more of an issue with Fight Night should the developers opt to pursue the same techniques. We're quite intrigued to see what technical decisions EA has made in bringing the game to PS3, so we'll update you on that as soon as we've seen some code.